Last week’s drink might have been a bit uncertain when it came to its geographical underpinnings, but this week’s is pretty clear that it’s an homage to Canada’s most populous city, a place I have not yet had the pleasure of visiting. The Toronto Star traces its origins to a 1922 cocktail book written by a London-based bartender who claimed the drink was a favorite of Torontonians but noted that the province of Ontario had its own version of prohibition between 1916 and 1927. Moreover, there’s no other known connection between the drink and the particular city it’s named for. That being said, it’s a truly worthwhile classic cocktail that can stand proudly beside any other city-named drink you can think of. In any case, this version of the Toronto Cocktail comes, once again, from David Embury’s 1948 “The Fine Art of Mixing Drinks.” Depending on how you look at it, it’s a variation of an Old Fashioned or a Manhattan. Since I prefer to make this one on the rocks, I’d say it’s more the latter than the former. Try it for yourself. First of all, let’s get one thing straight: no tigers were juiced in the making of this DOTW post. Moreover, I’m pretty sure, the makers of Tiger’s Milk bars don’t actually have the courage to milk actual members of the feline genus panthera to make their product. Now that we’ve got that straightened out, it’s my sad duty to report that I have no actual information about the provenance of this week’s drink or its rather silly name. It doesn’t appear to have been in any of the more famous classic cocktail books, though it’s certainly simple and straightforward enough that somebody must have made this drink back in the day. Who created it or where it came from before it lived in various places on the Internet is a mystery to me. The real mystery, though, is why it’s not better known. I think Tiger Juice is another example of a cocktail alchemy at it’s best. Three simple ingredients that definitely add up to something greater than the sum of their parts. It’s juicy, refreshing, a bit alcoholic, and 100% tiger-cruelty free. Combine the ingredients in a cocktail shaker with lots of ice. Shake vigorously and strain into a chilled cocktail glass. Sip and appreciate the fact that you are both adjusting your attitude and getting a good chunk of your daily requirement of vitamin C, without any added sugar. The benefits of red wine notwithstanding, I’m willing to bet that Tiger Juice just might the be the healthiest alcoholic beverage yet developed. The relatively high amount of sugars present in the otherwise very healthy OJ are balanced out by lemon juice, which I’m guessing has at least many goodies for your body with less than half the sugar calories. Of course, the downside of all that would be an overly tart flavor profile. Regular readers might remember that I’m a bit of a baby about that. To my utter surprise, however, I found that simply wasn’t the case. 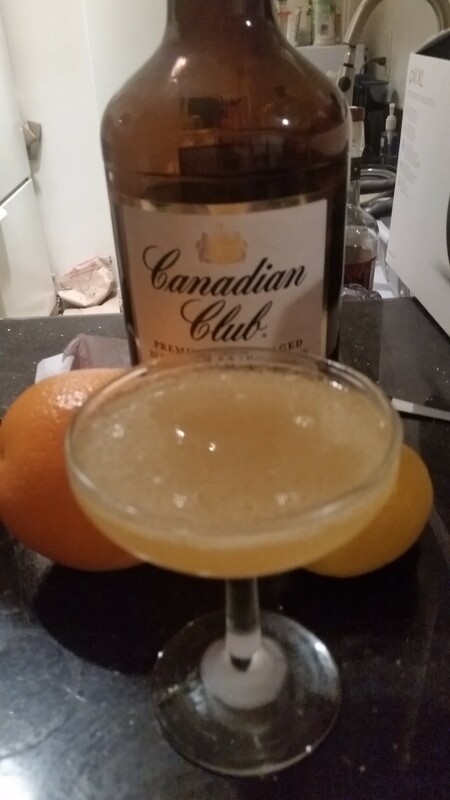 Combining the juices with Canadian Club — still my choice for the best bargain in booze at about $15-$18.00 for 1.75 ml bottle — yielded a drink that was neither particularly sweet nor noticeably tart. Instead, it was tasty, refreshing and just boozy enough to be interesting. For low calorie tipples, I’d place this next to something like a vodka martini among sophisticated drinks that go down very easy. That did change, though, when I tried other types of whiskey. Noticing that some online recipes called for bourbon, I found the sweetness of Maker’s Mark acted like salt on a melon in reverse, emphasizing the tart flavors in a way I didn’t particularly love. While most recipes wisely called strictly for Canadian booze, I figured that rye, Canadian whiskey’s close cousin, might be a worthy substitution. The usually outstanding Alberta Dark Rye, which is actually from Canada, was actually too flavorful and overpowered the drink. 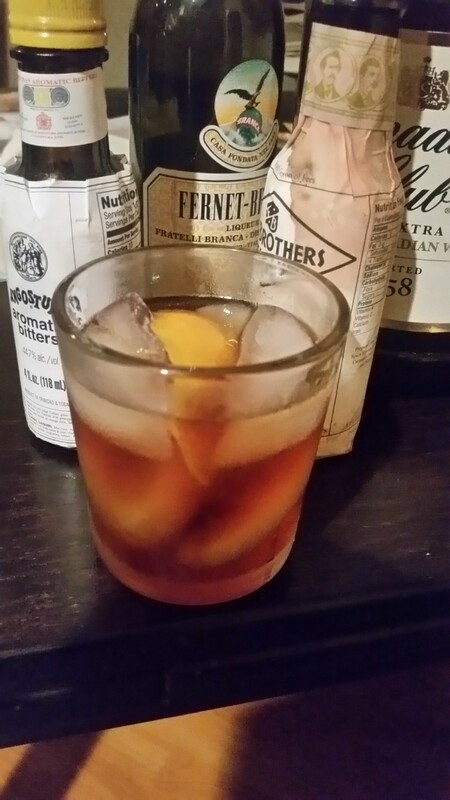 Old Overholt, on the other hand, proved its versatility as the craft bar’s default rye and worked reasonably well…but I still preferred the gentle simplicity of the Canadian Club. And that’s the thing. Ordinary Canadian whiskey gets a bad rap among the cocktail cognoscenti because it admittedly doesn’t boast the complex flavor profile of a really good bourbon or rye. The thing is, sometimes you want a little flavor, not a lot. And, yeah, I don’t drink them as often as I used to, but there are times when a vodka martini is just the thing. Now, maybe there are going to be times when Tiger Juice is just the thing. Memorial Day weekend of 2014 is about to get underway. For most of us, it’s just another Monday holiday and the gateway to summer vacation time. For those of us who have lost someone important in one of America’s wars, however, it’s another kind of day entirely. Though it’s origins are somewhat foggy, Memorial Day began as Decoration Day, honoring the many fallen soldiers on both sides of the American Civil War. Though it was intended as a solemn remembrance, especially given the shamefully scant number of days off most Americans get these days, you can’t blame people for spending it doing fun things like, say, making cocktails. That definitely applies to me. 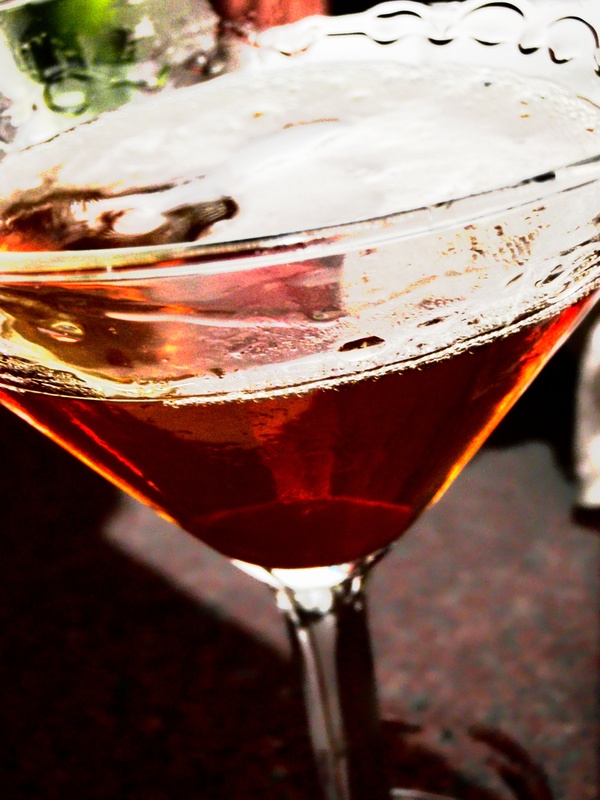 The Leatherneck Cocktail is one of the beverages unearthed by famed cocktail archeologist Ted Haigh in his hugely influential Vintage Spirits and Forgotten Cocktails. As many of you probably know, a Leatherneck is a member of the United States Marine Corps, but I think it’s fair to salute anyone who’s put themselves in danger and perhaps paid the ultimate price on behalf of the rest of us. Combine the ingredients in a cocktail shaker with plenty of ice. Frank Farrell, a Marine turned journalist credited with creating the Leatherneck Cocktail, said you should shake this drink “violently” and that’s not half wrong. Definitely a very vigorous shaking is in order to bring out its more refreshing aspects. Strain your Leatherneck into a cocktail glass and toast anyone you may have known who sacrificed something important in a war, anywhere in the world. If you actually don’t know anyone who’s endured that sort of a loss, toast that instead. A number of very familiar booze brands will probably work here. Technically, I believe, “blended” means any whiskey that’s not single malt or is also not “straight” bourbon or rye. In practice, a classic Leatherneck Cocktail must, I gather, be made with something that is North American and is neither bourbon, nor rye, nor Tennessee whiskey (e.g., Jack Daniels). Good examples would be most brands of Canadian whiskey, like my beloved Canadian Club or Seagrams VO. 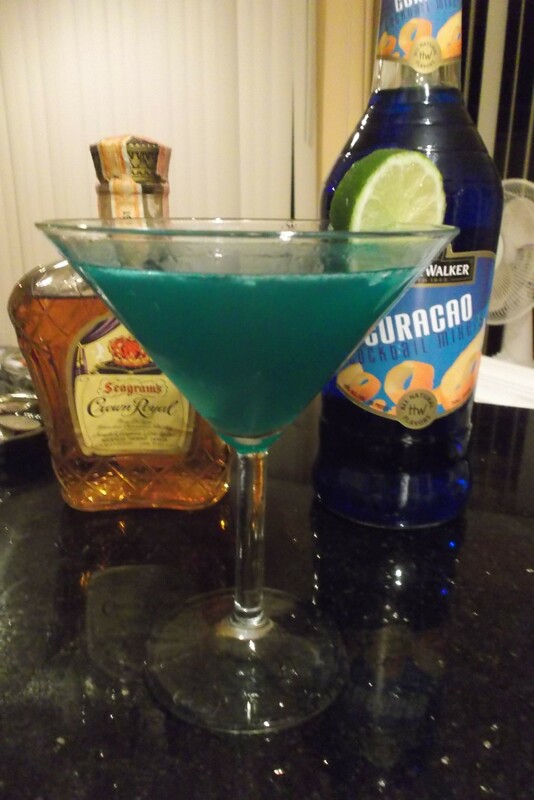 Seagram’s 7, which is actually U.S. made and blended, would definitely also qualify if you happen to have that around. Ted Haigh uses Crown Royal, which to me has always tasted like an ever-so-slightly smoother, higher-end version of Canadian Club. I usually have some CC on hand but didn’t this week. I did, in fact, have an actual vintage spirit on hand. It was an unopened bottle of Crown Royal dating back probably 20 years or more given to me by some beloved relatives of mine. This testament to the very moderate drinking habits of many Jewish-Americans comes to me from two of my very favorite cousins, who know who they are and how much I appreciate their generously provided free aged booze and overall wonderful cousin-hood. My Crown Royal-based cocktail definitely made for a refreshing beverage that, I think, is a reasonable credit to our fighting forces. Of course, this is a very simple drink — really, a whiskey daiquiri — that could maybe be spiced up and improved in a number of ways I’m sure. Any ideas on what could constitute a Flying Leatherneck? I am supposed to be mildly allergic to red wine. In fact, it was the discovery that wine tasting trips tended to give me a mild, brief malaise — somewhere between a feeling of actual sickness and very mild depression — that started me thinking a bit more seriously about the possibilities of hard liquor some years ago. Still, life has its way of surprising you and I’ve found a few drinks involving red wines that I’ve liked quite a bit. They mostly seem to involve egg white. 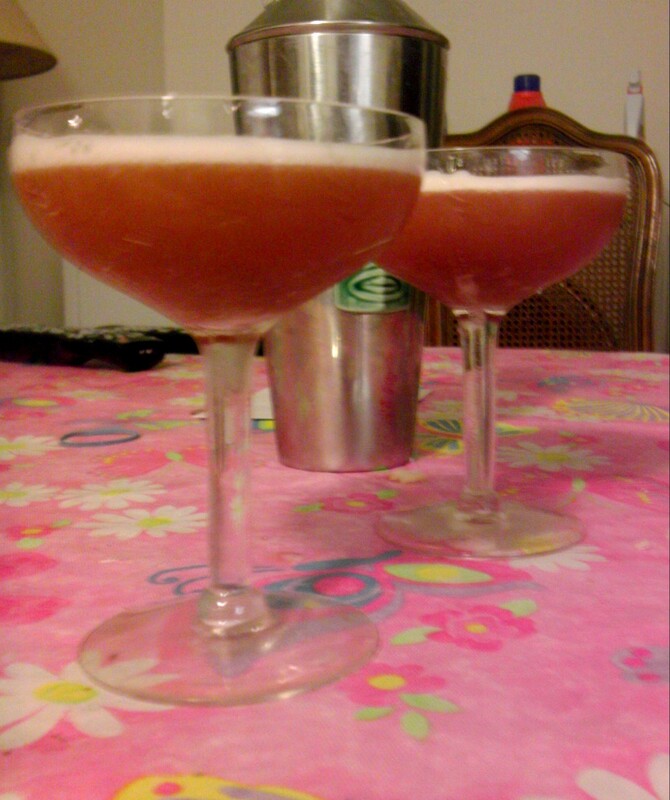 The wine in question is usually port or sherry, and that’s the case this week with a drink I found in Dale DeGroff’s The Craft of the Cocktail which he, in turn, found in the 1934 tome, The Artistry Of Mixing Drinks, written by Frank Meier of Paris’s Ritz Bar. Like most drinks of this era, it can also be found in The Savoy Cocktail Book. Most of the modernized versions you’ll find online, however, differ significantly from this week’s drink — significantly enough that I might consider actually revisiting it in a different formulation later on. In the meantime, I’m sticking with a minor variation of Mr. DeGroff’s recipe for this Friday the 13th. It’s pretty much the classic formulation in any case. Since measuring out half of the egg white of a large egg might be tricky, consider doubling up on the Elk’s Own and making two drinks. Even if it’s just you, it’s tasty enough you might want to drink both. Combine all the ingredients in a cocktail shaker and shake without the ice. Then, add plenty of ice cubes and shake once more, this time quite vigorously. Strain into a cocktail glass or glasses and toast the Elks Lodge. We’re not at all sure they had anything to do with this drink, but I’m sure they could use a salute. I didn’t have as many chances to play around with this week’s drink as I’d have liked, so I didn’t manage to even try the more stiff/modern style version; it ups the amount of whiskey to about 1 1/2 parts and the port down to 3/4 of an ounce but uses an entire egg. Some other time, for sure. Getting down to my choice of ingredients, I used an inexpensive bottle of tawny port that I had on hand, but some people seem to lean towards ruby port, which might be another excuse to revisit this one at a later date. For my hard liquor, I went with my beloved Canadian Club on my first try, as Mr. DeGroff specifically calls for Canadian whisky. Later, I went with the understandably very popular Redemption Rye. As implied by the directions, I made two drinks each time using one large egg white, out of respect for the for the fact that the DeGroff recipe called for a small egg white, and where the #3$#@$ do you find a small egg these days? My substitution of two teaspoons of sugar if you don’t have any simple syrup handy is a highly educated guess that I’m pretty sure will work. I didn’t have the opportunity to try it out during a particularly crazy week. Every version turned out just dandy, but I have to say I especially enjoyed the less complicated charms of the DeGroff Canadian Club iteration. Redemption Rye may be the better product on its own but, for this one, I think you can definitely save your money and reduce the alcohol volume a bit downwards if you want. As to why this was a particularly crazy week, for starters, I successfully fought of a cold virus through the magic of zinc, drowsy Robitussin DM, no booze, and tons of sleep over last weekend. [CRUCIAL UPDATE: Actually, I wasn’t successful; the cold came back with a vengeance the day before I posted this. The world must know!] More notably, I closed escrow earlier this week on the new location of Drink of the Week Central. That means my and my outsize staff of researchers, chemists, molecular gastronomists, expert horticulturalists, and inebriate engineers will be moving over the coming weeks. It’s good news for the hardy DOTW team and should, at least, lead to better drink pictures. The alarming consequence for you, however, is that it also means we may be taking a week or two off in the coming six weeks or so — just moving all the bottles should take a solid week! You’ve been warned.